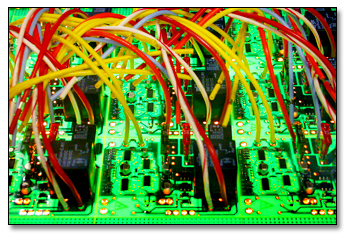 For more information about our Electronic Contract Assembly Services click here to contact us. With AMS, you get all of the assembly, engineering and testing assistance you need. You will be provided with high-quality printed circuit boards and electro-mechanical assemblies manufactured to the most stringent of IPC standards. If you need assistance with design, re-design, printed circuit board (PCB) layout or prototyping for applications in automation, industrial, medical, power, process control or consumer electronics, AMS is ready to become your strategic partner. AMS offers Through Hole, Surface Mount (SMT) and Mixed Technology PCB assembly. Unless specified otherwise, we manufacture all PCBs to IPC Standards Class 1 and 2. To best meet your needs, our SMT line supports ultra fine pitch, and component placement down to 0201 parts. AMS will have BGA placement and X-Ray available starting in January 2015. When it comes to electromechanical assembly, AMS builds cables, harnesses and enclosures to the highest standards by using state-of-the-art auto-prep and auto-crimping equipment. At AMS our functional and final systems testing will give you the knowledge you need to exceed your customers' expectations. We know that the smallest defect on a component can mean the difference between a PCB that works, and one that needs to be repaired. That's why we perform testing that checks for shorts, opens, resistance, capacitance and other faults to determine whether the PCB was fabricated correctly. Our special processes go beyond the typical capabilities of an electronic contract manufacturer.